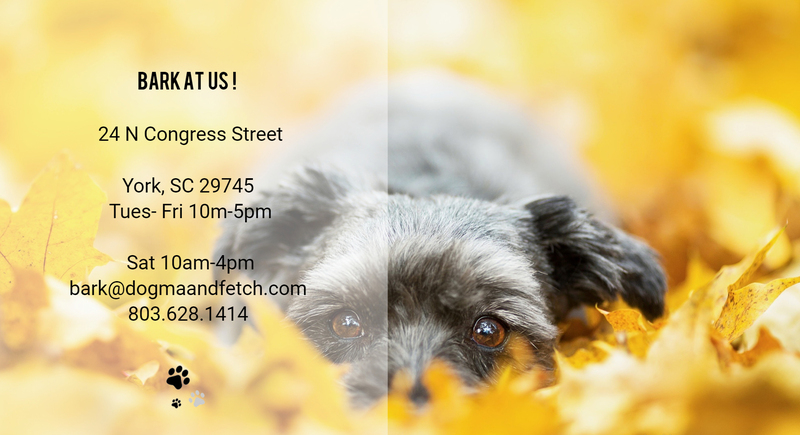 All dog breeds are welcome at Dogma & Fetch. However, to ensure a safe environment for all, we do have to follow some rules that everyone must follow. All dogs must be on a leash or in a carrier at all times. Retractable leashes are allowed, but must be locked to no more than 6 feet while in the store. Pets must be attended and under your supervision at all times. If your dog has an “accident” in the store, let us know immediately so it can be cleaned up. The store is our home…please treat it as you would your own. Please keep a close eye on your dog while in the store. You are responsible for any damages caused by your dog (chewing, knocking over, leg lifting, etc.). Aggressive or disruptive dogs may be asked to leave at management’s discretion. Children must also be supervised while in the store. We want everyone to have a fun and enjoyable time while visiting, but without proper supervision, there is a risk of someone being hurt. Additionally, there are breakable items in the store and if they break it, you buy it. Please be responsible and pick up after your pet. If your dog goes poo outside, we provide bags for you to pick it up so others don’t step in it. While you think your dog is friendly, you cannot completely predict his interactions/reactions in all situations. Nor can you predict the response of another dog. For this reason, it is imperative that these rules are followed at all times. Thanks for understanding that a safe and enjoyable experience for everyone is our goal.